We live in a very bustling, up-and-coming neighborhood full of different restaurants, bars, etc. Luckily for us, everything is within walking distance. It’s a nice perk to have. However, I will be the first to admit that when it comes to these restaurants not one really sticks out as an OMG-I-want-to-eat-here-everyday type of place. Most people would disagree, but then again, they probably aren’t vegetarian. So, you can imagine how excited I was when I learned about Cinquecento via one of my favorite Miami Instagram accounts. I think the picture that drew me in was of a cheesy slice of pizza with a caption that read “Best pizza in Miami.” Obviously, my immediate reaction was to go online, find the exact location and memorize the menu. I’m kidding about that last part…kind of! Anyways. Location – check! Menu – check! I didn’t think we’d actually get a chance to eat here until after Vishnu’s exams. But yet again, the prospect of eggs on a Saturday night changed that rather quickly. I mentioned Cinquecento to Vishnu, and he agreed that it sounded like a good dinner option, especially since it’s so close by. The first thing I noticed about the restaurant was the big option outdoor seating area – perfect for large groups. I loved it so much that we decided to be seated outside. That is until the mosquitos decided we were dinner. Then we moved inside. The inside of the restaurant is very cozy and reminiscent of a small European café. I loved the open feel, the black and white artwork on the walls, and the prominent brick oven. When more people learn about Cinquecento, I can see there being a long wait due to the space restraints. But luckily it was perfect when we went. 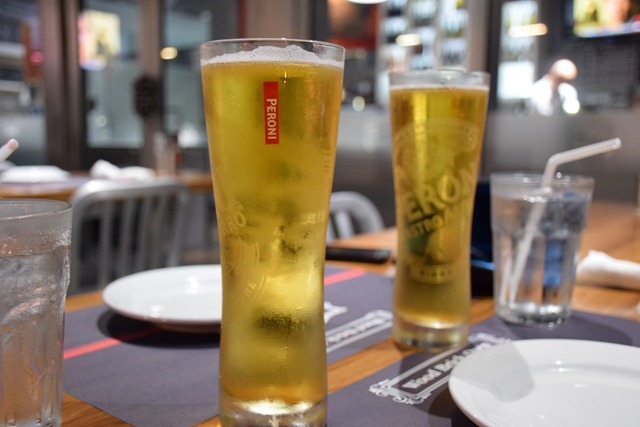 Our bubbly waitress told us more about the restaurant while we sipped on our Peronis. The restaurant has only been open in Brickell for a month (hence the empty feel). Everything is made in-house – the pizza dough, the Panini bread, the pastas, the gelato…everything! In fact, the front corner of the restaurant is usually occupied by the pasta maker where he shows off his skills for customers! Oh and wine bottles are 50% off every Wednesday – I think we need to go back on hump day! After hearing all of this, we were eager to order. 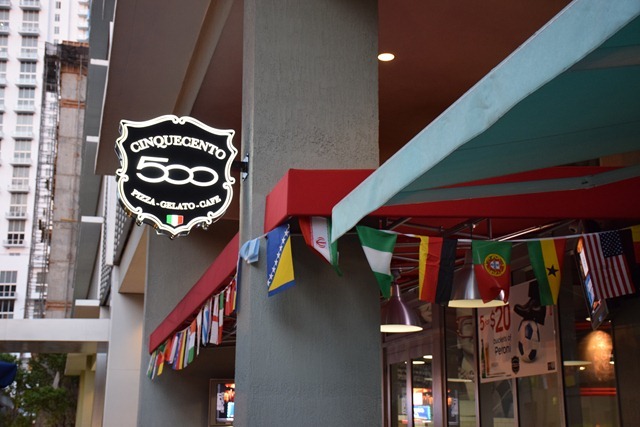 The menu is full of so many delicious options – salads, burgers, paninis, pastas, pizzas, calzones, empanadas, etc. 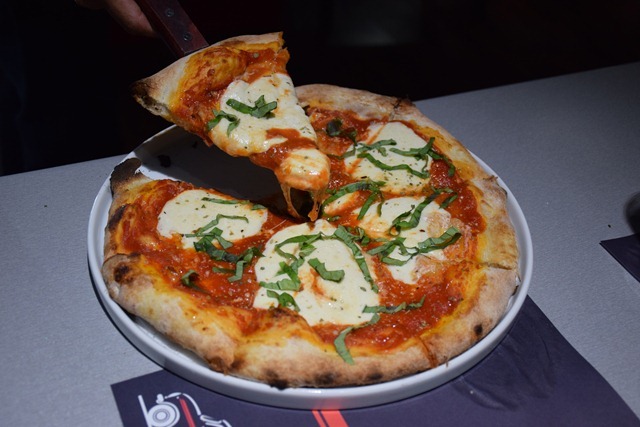 I ultimately went with the Mozza Fresca pizza – tomato sauce, fresh mozzarella, basil, and truffle oil. 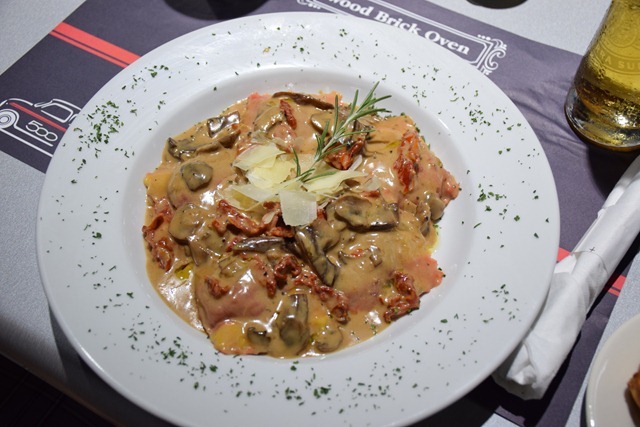 Vishnu was craving pasta, so he decided to go with the special – short rib ravioli in a creamy mushroom sauce. The pizza was everything brick oven pizza should be. The crust was light and airy with a nice crunch. I could tell the sauce was simply made with tomatoes, a little garlic, and oregano. And the creamy mozzarella and truffle oil (oh the truffle oil!) were perfection. As far as Vishnu’s dish was concerned, I wish I had video of him taking his first bite. It was awesome! He said it was one of the best things he’s tasted, and I believe him. The meat was tender, the pasta was al dente and perfectly cooked, and the sauce was a little spicy. Meat + Pasta = Happy Husband! 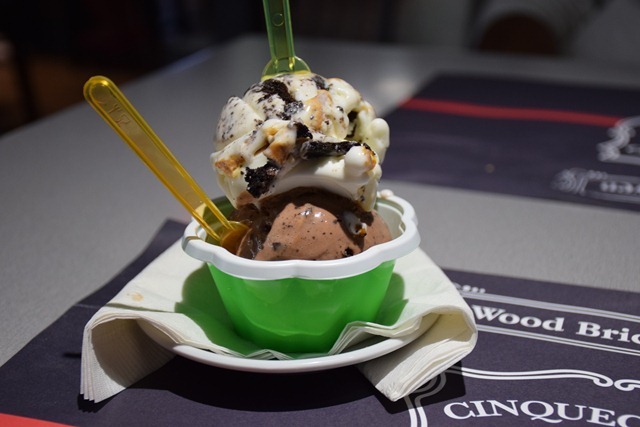 And of course we couldn’t leave without trying the famous gelato! After trying four different flavors, I decided on the Oreo gelato and let Vishnu pick the second flavor (Swiss Chocolate). You would think that two people who just indulged on some delicious Italian food, would not be able to eat more than a few bites of dessert. But no – we ate it all! I can see why people rave about this stuff – it was very creamy and the flavors we picked were true to their names. We headed home full and happy. I see us eating many more lunches and dinners at Cinquecento, and I think it’s safe to say that I’ve found my OMG-I-want-to-eat-here-everyday restaurant! And how multicultural..world cup FEVER! Please tell me I’m not the only one laughing that you ordered ‘Swiss’ chocolate at an Italian restaurant. 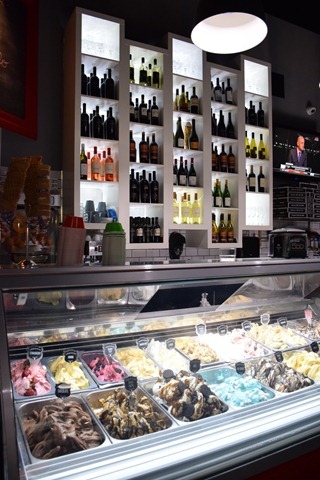 That gelato looks heavenly! Happy Wednesday!! I wish Miami had more veggie friendly Cuban places! I need to do a little more research. 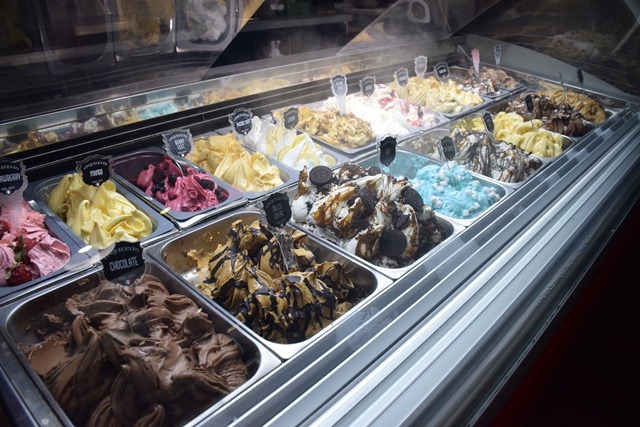 Good lawd- pizza & gelato….now THIS looks like a fantastic meal. I can’t decide whose entree looks more delicious!! I am glad you guys finished your ice cream- if not, I would be majorly questioning your dessert cred ;)! Oh you know me…if it’s put in front of my face, I will eat it! I love those kinds of restaurants…places you know you could eat at over and over. CPK isn’t as elevated (obviously) but it’s a go-to for us! Only wish there were more locations in NYC. I’m sure you have a ton of those in NYC! And CPK is one of my favorite chain restaurants…love the food there!